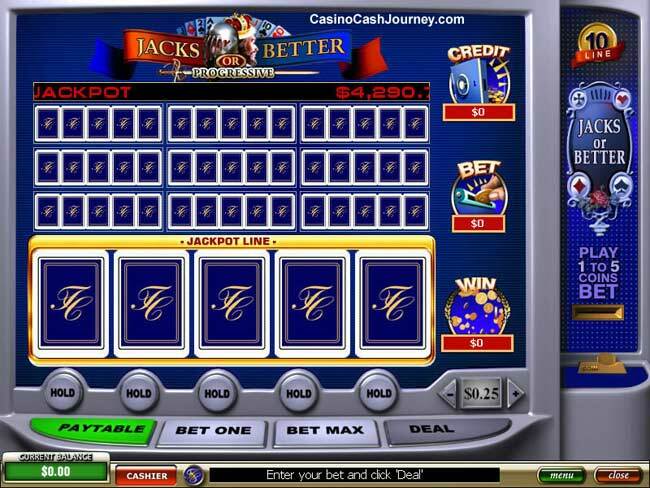 The object of 50-Line Jacks or Better is to obtain a five-card poker hand that contains a winning combination. It differs from original Jacks or Better, since it has fifty lines of cards. Each line uses a different deck of cards. Each line is treated as a separate hand for the determination of any wins. The bet size you choose is per one line. Since there are fifty lines of cards, fifty times the single line bet amount is subtracted from your account balance. Your total bet amount is shown in the lower right corner of the screen, after the label “Bet”. · Choose which cards you wish to keep by pressing the Hold button underneath the card, or by clicking on the card itself. Held cards are used across all fifty lines of cards. An auto-hold feature exists for this game whereby cards that make up a winning hand on the initial deal are automatically held for the player.